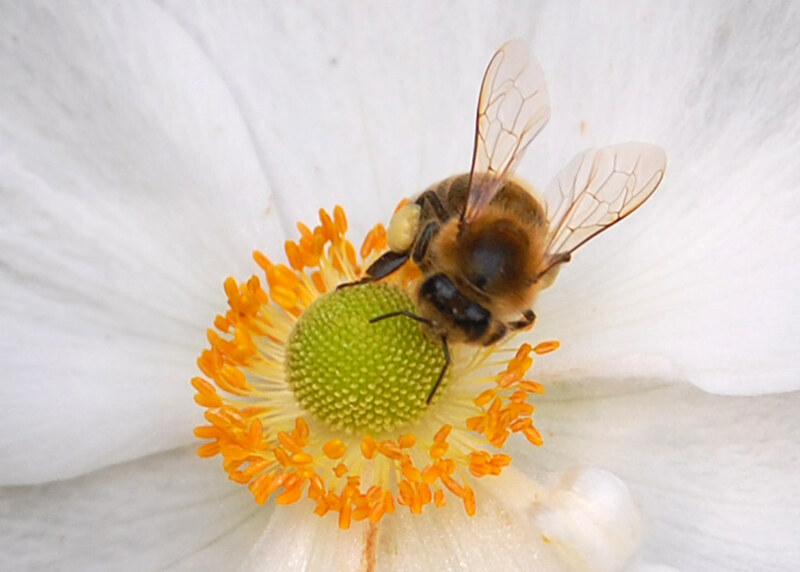 When people talk about bees, they are almost always talking about the European Honey Bee. But there are over 20,000 species of bee worldwide, and you might be surprised to learn that only a portion of them make honey and several of them don't even pollinate. Wild bees are extremely important to life on the planet, moreso than just the managed honey bees who are deployed for human agriculture. It is thought that the flowering plant developed in concordance with the pollinating insect, and that this development in Earth's evolution of life literally changed the planet into one that we can inhabit today. Bees, in all their varied forms and behaviors, are super important to the planet -- and, selfishly, to people. Check out all the different types of them that you may have even seen and not realized you were looking at bees all along! This is the bee that humans like and need, so it follows that this bee is usually the only bee anyone knows about. There are probably about 44 subspecies of honey bee, but we have only identified about 11. Native to Europe, these bees were prized for their gentle nature and honey-making skills. They were put to work by humans a very long time ago - there is evidence that we were managing bees for honey as far back as 15,000 years ago. The honey bee is the only species of bee that dies after stinging -- the barb on their stinger will hook into the threat and pull out of the bee's body along with the poison sac, rupturing the abdomen. In 2006, managed colonies of honeybees began mysteriously dying off. It was speculated that a combination of varroa mites and pesticide use were to blame, but the evidence is not yet conclusively pointing to any one factor. Managed hives are rebounding as beekeepers actively work to keep their hives healthy and breeding -- but wild bees don't have managers and the mites, habitat loss and possibly pesticides are taking their toll. Who doesn't love these big, fluffy, hovering tanks?! There are more than 250 species of bumble bees, most in North America. While they are social bees, unlike the large colonies of honey bees, they usually live in colonies of less than 50. If you are wondering if the bee you are looking at is a bumble or the similarly sized Carpenter bee, the back leg will have a shiny concave place that is bare and surrounded by fringe - called a corbicula. Bumbles are calm, easy-going ladies and won't sting unless their colony is threatened. You will almost never see a male bumble unless it's mating season, because as soon as the drones finish mating with the Queen, they are driven away. Ladies Only club! There are about 140 species of mason/leafcutter bees worldwide. These bees are major pollinators - one bee on its own can pollinate up to 2000 flowers a day. For this reason, orchards love them and will breed and let them loose in their trees. There is no hive to manage, however, because these bees are not social and live solitary lives. She is a mellow, easy-going bee and, like most bees, will only sting when threatened. Each bee finds a narrow hole, tube or mud to dig in and then builds her own nest out of mud or plant fibers that she has chewed to paste. Leafcutters are in the same group as masons, they will cut round pieces of leaves to line the inner walls of their tubs... if you see a nearly perfect circle cut from the leaves of your garden plants, that would a hard working leafcutter taking care of her nest. They are beneficial to your garden as pollinators, and do not harm your plants. Carpenters are super-cool bees, just because of their looks. The are big, and often mistaken for bumbles... but you can tell the difference with a closer look because they tend to have dark bodies and will have a shiny bare spot on the top surface of their abdomen. Unlike some other bees, you can even tell the male apart from the female: the ladies have black faces and the dudes have yellow faces. Like bumbles and honey bees, these guys are also pollinators. What sets them apart, and gives them their name, is the fact that they drill nearly perfect round holes between one half and one inch in diameter into wood. Because of this nesting behavior, they are generally bees that you don't want around your home as they will drill into any wood surface and riddle your house/deck/siding with holes.